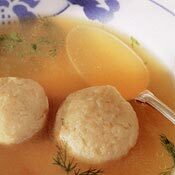 RECIPE TITLE "Aunt Gillie's Matzo Ball Soup Recipe"
Chicken soup is a universal panacea--invoked by many cultures as a cure for colds and broken hearts alike. With matzo balls added, it becomes a meal--and a must for any traditional Jewish American Passover Seder. This recipe comes from Gillie Feuer of Long Island, New York. TO MAKE SOUP: Combine chicken, carrots, onions, celery, parsnips, leeks, garlic, dill, parsley in a large stockpot with water to cover. Bring just to a boil over medium-high heat. Skim foam. Reduce heat to low and simmer for 2 1/2 hours. Strain and discard solids (chicken may be reserved for another use), then cool to room temperature. Refrigerate for at least 3 hours, then remove any solidified fat from the surface. TO MAKE MATZO BALLS: Grate enough onion to yield about 2 tbsp. and set aside the rest. In a large bowl, combine grated onion, eggs, margarine, matzo meal, parsley, and 1/4 cup water or chicken soup. Mix well, season with salt and pepper and set aside to rest for at least 30 minutes. TO SERVE: Heat soup over medium heat and season to taste with salt and pepper. Add matzo balls and heat through. Garnish with dill sprigs. Recipe reprinted by permission of Chronicle. All rights reserved. Thanks to the ever-increasing number of kosher products available to home cooks, it's never been easier or more satisfying to prepare delicious, wholesome, and healthful kosher meals. 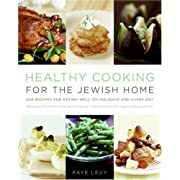 In this new collection of exciting recipes, acclaimed journalist, cooking teacher, and cookbook author Faye Levy presents a progressive, upbeat approach to nutritious kosher cuisine that highlights the pleasure of preparing and eating mouthwatering dishes that promote well-being. Kosher foods are being used in more and more American homes, and their abundance and diversity is increasing at an impressive rate. From the traditional to the exotic, from extra-virgin olive oil to tasty cheeses, from spicy condiments to Asian-style sauces, from Latin flavors to Indian, Levy introduces both novice and seasoned cooks to a grand array of international ingredients. 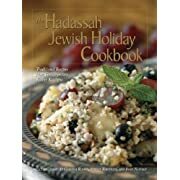 By showcasing them in such dishes as Poached Turkey with Mushrooms, Wheat Berries, and Dill; Diced Vegetable Salad with Pepitas and Papaya; Marseilles-Style Fish with Saffron and Fennel; and Turkish Autumn Vegetable Casserole with Chicken, she shows how they will add zest to any menu while maintaining solid nutritional value. Got kugel? Got Kugel with Toffee Walnuts? Now you do. Here's the real homemade Gefilte Fish – and also Salmon en Papillote. Grandma Sera Fritkin’s Russian Brisket and Hazelnut-Crusted Rack of Lamb. Aunt Irene's traditional matzoh balls and Judy's contemporary version with shiitake mushrooms. 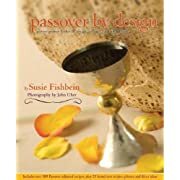 Cooking Jewish gathers recipes from five generations of a food-obsessed family into a celebratory saga of cousins and kasha, Passover feasts – the holiday has its own chapter – and crossover dishes. 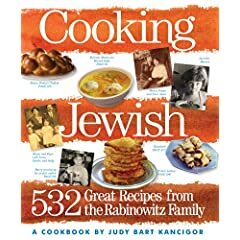 And for all cooks who love to get together for coffee and a little something, dozens and dozens of desserts: pies, cakes, cookies, bars, and a multitude of cheesecakes; Rugelach and Hamantaschen, Mandelbrot and Sufganyot (Hanukkah jelly doughnuts). Not to mention Tanta Esther Gittel’s Husband’s Second Wife Lena’s Nut Cake.